Highlands Road was apparently known as Frosthole Lane - it's not clear how formal this name was as there is very little evidence for it at all, but it appears to have taken its name from Frosthole Coppice (through which Oak Road runs), which would have been towards the end of the road. Maybe Frosthole Crescent, which isn't near it, was named as a spur of what we now call Highlands Road? The new name, of course, describes its path across the highest land in Fareham, and is more appropriate now that it is heavily built up - and Frosthole Coppice is pretty much gone. 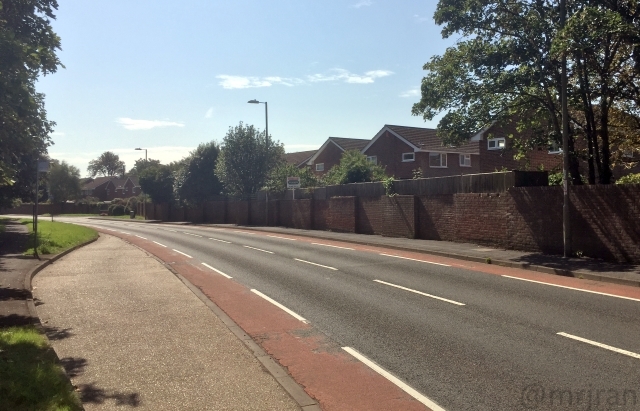 There is a theory that a path along what we call Highlands Road was built by the Romans to access the Isle of Wight. True or not, it's nice to know. Its starting point is by the former Fareham Brick Works on Kiln Road. Behind this was a gravel pit which was used by industry all over town, this became Green Hollow close. On the other side, The Cedars is built over Maylings House, which once had donkeys roaming. In the corner was a house built in the 1920s. The Maylings Manor Hotel used to be here. The scout hut is on the site of the former Hill Farm. The path leading to Miller Drive, by the entrance to the railway tunnel, once lead towards Maylings Farm and the pits surrounding it: it was not a through road. East Glory Cottage stood down the path, near the bend in the road. Sand pits were dug around it. The clinic down Frosthole Close was developed as an isolated hospital for people with infectious diseases in the 1890s, at the time this would have been far from any development. In the 1920s two large houses were built opposite and tqo more on the bend. By the 1950s, that hospital had closed and become Highlands County Infant School. 14 semi-detached houses on a small street called Frosthole Close were built by 1965, known as the Frosthole Estate. By the 1980s this had become Frosthole Crescent, and the road through the school became the new Frosthole Close with a hall and a clinic, and most of the other buildings replaced. There were still some gaps, like the end of Inverness Avenue, which weren't built up until later. The alleyway between the new Frosthole Close and Highlands Road is on the line of the secondary entrance to the school. There was a farm access road along the eastern boundary of the school. More houses were arriving on the north side of Highlands Road in the 1950s, with a gap left for Kennedy Avenue. The rest of Kennedy Avenue and the estates around it first appeared on the map in 1970. 30 Highlands Road was demolished by 1983, and became Mary Rose Close, with Woodhall Way appearing in 1972. 32 Highlands Road was demolished too. There was an old property close to a tree coppice called Coppice End, with a property opposite appearing by 1909. Hill Park Road appears on the next map (1932), mostly with houses on the west side, including a couple of large ones at the end. Hill Drive was built in the 1940s, and a couple of properties were built in the coppice, including one which was broken up to three in the 1980s. By the 1970s, the large houses on Hill Drive had been replaced by a lot of much smaller ones, including Pennington Way and the east side. With a new street numbering, numbers 95 to 105 were among few to survive the change. Another large property was knocked down to build Kingston Gardens in the 1970s, and Thames Drive appeared at the same time. The Deviation Line car park is evidence of an abandoned railway line. Continuous problems with flooding and instability in the tunnels passed earlier meant that a better route was needed, and in 1904 the deviation line opened to provide an alternative route, running through hill cuttings rather than tunnels - this is why the car park is lower than the road. To the north, the former line still manages to divide the Hill Park and Fareham Park estates. It closed in 1974 and the narrow brick arch bridge that took Highlands Road over the line (with pedestrians carried over a separate rattling iron bridge) was filled in. The extent of the bridge and its embankments can still be made out today by looking at the length of the road with no houses along it. Roughly speaking, there would have been a footpath here before the line was built. Heather Gardens was built in the 1960s on a spare piece of land, but the far end was built in the 1980s over some of the old railway line. The working men's club first appeared in the 1940s, next to a slightly older cottage. Fareham Park (which actually forms the main part of Hill Park, but not the bit around Hill Park Road, if that makes any sense at all) began to develop in the 1930s, as did some of the houses on the north side of the road, the Highlands Pub (Hampshire Rose), post office and two on the site of the shops. Fareham Park Road (previously Iron Mills Lane) went through Iron Mill Coppice to Funtley House, with a branch heading over to Fareham Park. The next map, dated 1956, shows Hillson Drive (with gaps left for the branches), and the roads across to Fareham Park Road. The joinery works are shown for the first time, as is a nursery by number 33, and houses stretch into Iron Mills Cottage. Iron Mills Close, Park Farm Avenue, Nashe Way, Privett Road and Fareham Park School all came along a few years later. The motorway caused Iron Mill Cottage to be demolished, but most other properties survived. The 1956 map also shows more houses with large gardens along Highlands Road. Shops used to continue with a chip shop and hairdressers in Fareham Park Road. By 1970, the Highlands Shops had been built, mostly replacing the existing houses there, but the three at the east end survived. The larger shop at the west end is now the Co-op, previously Somerfield, Gateway and Bejam. Post-war development saw the arrival of Stow Estate, but it wasn't anything like it is now. The original road had prefabricated housing connected by paths and not roads, with what we today know as Stow Crescent being a single road which ran in a straight line from an entrance by the car showroom (actually two entrances: one was a straight line and one cut the corner, the latter being today's alignment), through to a large oval with a road through the middle. Ocean Close is roughly where the road ended. This was all redesigned in the 1960s to provide denser housing to meet what was required, as well as the ambulance station. Equally, 1920s houses on the north side were knocked down to create Norset Road. The third railway the road crosses was built in 1889, so all the development has been built around it. Beyond the railway line, the first houses arrived in the 1920s, with the whole north side (up to the bends in the road) being sold to form large houses with small gardens. By the 1950s, the first half of Oak Road, Blackbrook Road and Bradley Road were built over Frosthole Coppice. A 1920s property called Byeways was kncoked down to create the petrol station. Woodvale started to be built in the 1960s, and the aforementioned streets were finished. Before development, many of the fields around here were used to grow strawberries. Greyfriars Road (and Abbeyfield Drive a few years later) was built in the 1960s by knocking down a house on Highlands Road. 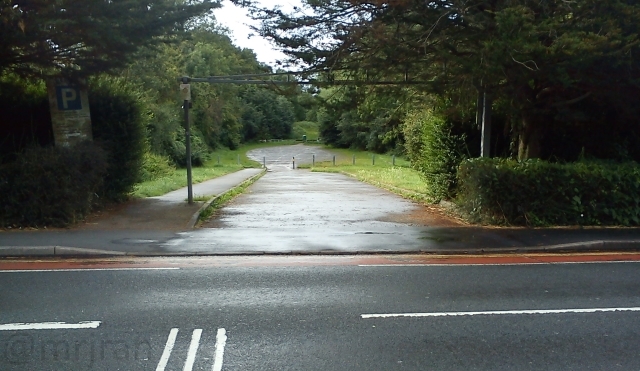 Pigeon House Road was first shown on the same map, with the footpath to the playground being drawn 10 years later over a pond. 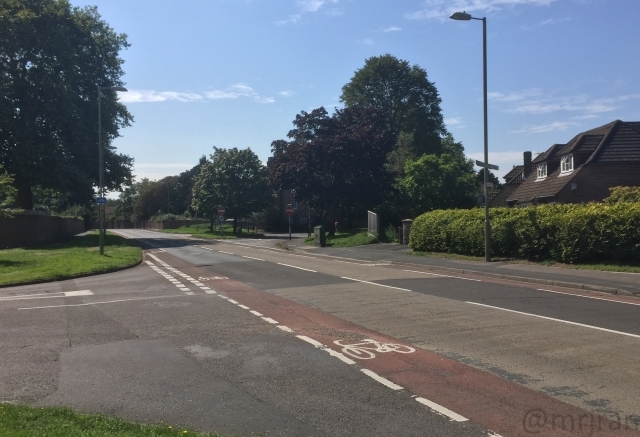 The double-bend on Highlands Road appears to have been to avoid ownership issues with one of the fields ("ge'rroff my land" and all that), now much softer as the road has grown. Alternatively, it may reveal an old trackway or farm access leading to Fishers Hill. 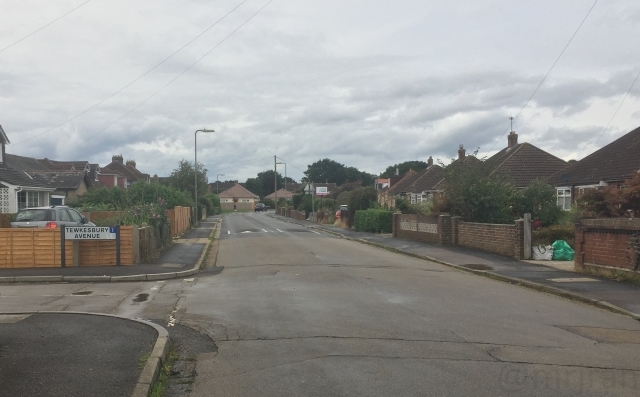 The housing here was built in the 1940s and reveals the original end of the road, on Catisfield Road. 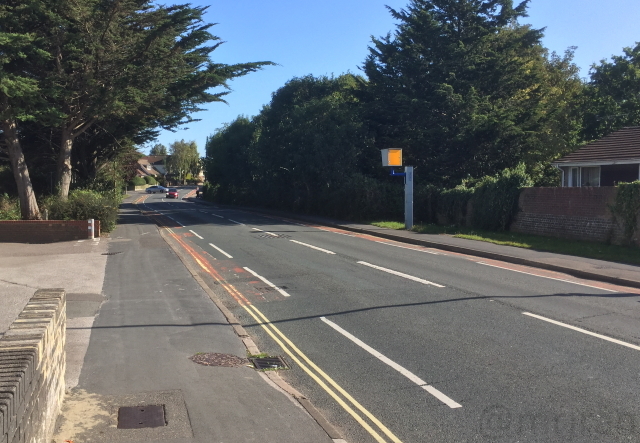 Access to the A27 was provided either down the wide eastern end of Catisfield Road, as it is now, or the narrow western end of Catisfield Road, which was blocked off in 1968 and named Catisfield Lane to avoid confusion. It was then that Highlands Road was extended to meet The Avenue. The extension is not a direction continuation, but a second road built slightly offset, which hides the majority of the evidence where the old road meets the new one. In 1963, a series of roads with names like South Lodge were built. These snaked their way around Catisfield Lodge, which was positioned where the old road meets the new. It was demolished in around 1968 to create Beechcroft Close, and to allow the new road to run through its grounds. The new road ran along the back gardens of South Lodge with its own branch, Hampton Grove, soon being added to fill the remaining gap. At the end was the telephone exchange, which replaced 124 The Avenue. At the same time Catisfield saw considerable development, mainly by using all the land in the centre of the aforementioned streets. The land around the Limes Hotel later made way for the apartments around Samuel Mortimer Close in 2014, with the former methodist church/Catisfield Memorial Hall next to it. At the back were nurseries.